If you want to ride a Moto Guzzi for a weekend on holiday, or just a couple of hours, you can hire it at Agostini Mandello, historical Moto Guzzi dealer known worldwide for its kindness and competence offered to all the fans of the brand for more than 50 years. From Mandello del Lario in short time you'll reach wonderful alpine passes, lakes and arts cities, the historical Lario circuit and the tour of the lake, Valsassina and Valtellina, and all the charm offered by this part of Italy with its foods and wines. 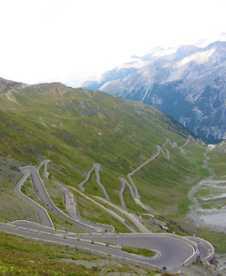 Which better way to discover all this than the mythical motorbikes built right here? 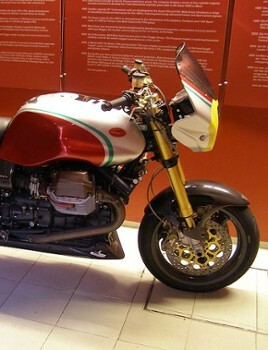 The Moto Guzzi Museum is located inside the historic factory that has seen the birth of the legendary Eagle in 1921. 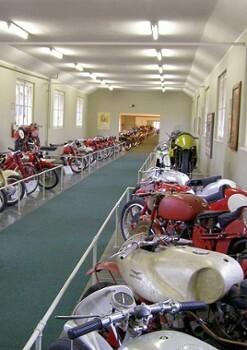 Historical, technical and cultural heritage, the museum displays a rich collection of over 150 motorcycles, racing motorcycles (built until 1957, when Moto Guzzi racing activities ceased after over 3300 victories), experimental prototypes and engines, in a path over time witnessing the glorious history of a timeless Italian myth, recognized all over the world. 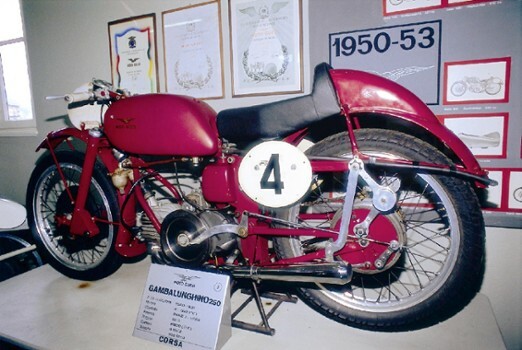 The museum exhibits unique items such as the first motorcycle built by Carlo Guzzi in 1919, next to vehicles among the most famous in the world, as the unique 8 Cilindri 500 of 1957. The exhibition area, besides telling the story of the Eagle of Mandello, offers a glimpse of the social and economic situation of our country. The section "The Sound of Passion" complete the museum tour by showing on screen some of the most interesting videos on the history of Moto Guzzi. 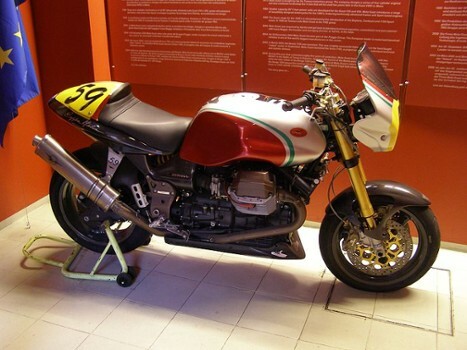 The museum showcases the Moto Guzzi history and culture, bringing together a rich collection of over 150 exhibition pieces of production motorcycles, sport bikes, prototypes and experimental engines. The exhibition area consists of a collection of over 80 vehicles, along with the story of the production history of the Mandello Eagle and offers an insight into the social and economic development of the country. 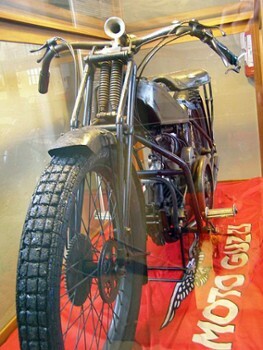 In the case of the Norge 1928, the first dedicated touring mahcine in the history of the motorcycle designed by Carlo Guzzi and his brother Joseph. The Guzzi Sport and GT series of the thirties, the Airone the most popular middleweight motorcycle in Italy from 1939 to 1957 or the Falcone model a dream for many of the riders of the fifties. Moto Guzzi is remembered in history for creating vehicles for the mobility of Italians after the war, such as the lightweight 65 Guzzino and for "reinventing" the sport concept in the late sixties with the V7 Sport. Besides production bikes the exhibition displays a dedication to motorcycle racing. 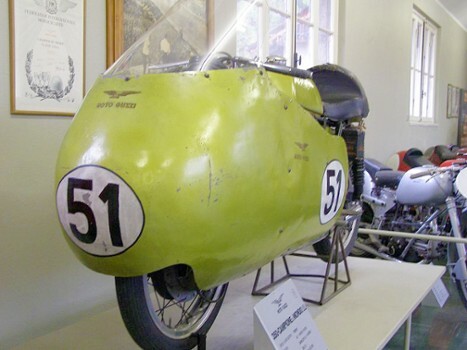 Among these legendary race machines is the Guzzi 4V of 1924 which Guido Mentasti won the first European title at Monza, the twin 500 of 1946 of Omobono Tenni, the Guzzi 350 "World Champion" in 1955, and more recently the V7 series which set 19 speed records in June and October 1969 at the Monza circuit. Monday to Friday 3:00 p.m. to 4:00 p.m.. In the month of July: Open from 2:30 p.m. to 4:30 p.m.. The Museum will be closed: - From 2 to 31 August - The 8 of December - From the 20 of December to 6 of January. Nearby Things to Do include: Castles & Ruins such as Maggiana Tower; Museums such as Silk Museum Abbadia Lariana and Museo del Ciclismo; Water Activities such as Lido Mandello del Lario and Lido di Abbadia Lariana; Hikes & Walks such as Sentiero del fiume and Cenghen per la Val Monastero; Towns such as Dervio and Cernobbio; Churches such as Santuario della Beata Vergine del Fiume and San Giorgio.